Sports Try Outs with A Hog Roast Hyde! 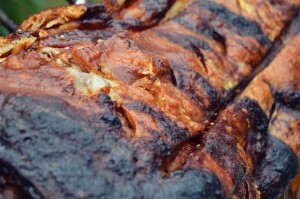 This weekend saw Hog Roast Hyde cater at a new type of event which is always exciting. It was the local colleges sports try outs! So, there would be lots of teenagers trying out for various sports teams throughout the day and no doubt all extremely hungry at the end of it which is where Hog Roast Hyde comes in. We were asked to prepare food for up to two hundred people as the organisers were not exactly sure how many would turn up. The teams looking for players were the netball team, football, hockey and badminton so there really was a lot at stake. We brought along a hefty hog to slow roast throughout the try outs and we also prepared food for any one with dietary requirements. This included making some gluten free bread rolls and preparing some vegetarian dishes such as our delicious halloumi skewers and vegetarian tart that always goes down well. With the hog slowly roasting away all we had to do was wish everyone good luck in the try outs and await the hoard of hungry kids. By 5’o’clock the try outs were over. Unfortunately, the results would not be announced for another week, so we helped to settle peoples nerves by serving up a Hog Roast Hyde treat. We cut freshly baked bread rolls and added a pile of moist slow roasted meat. We topped this with lashings of our homemade applesauce, and crispy crackling that everyone adores. As always, we made sure to clean up everything on site which was especially important as the organisers had a lot of sports equipment to pack away and they had worked so hard already we wanted to make sure we did our part. Good luck again to again to everyone who tried out – you have done yourselves proud!